I’ve been pondering the relative lack of impact on people of the coral reef crisis. Reefs have been degrading for a long time, probably ever since human populations became powerful enough to rearrange the landscapes near them or catch fish in significant quantities from their waters. But degradation and loss of coral reefs has hastened over the last 40 years or so, and projections for the future are dire. I thought that would prove a powerful wake-up call to humanity about what we were doing to our planet. That did not happen. 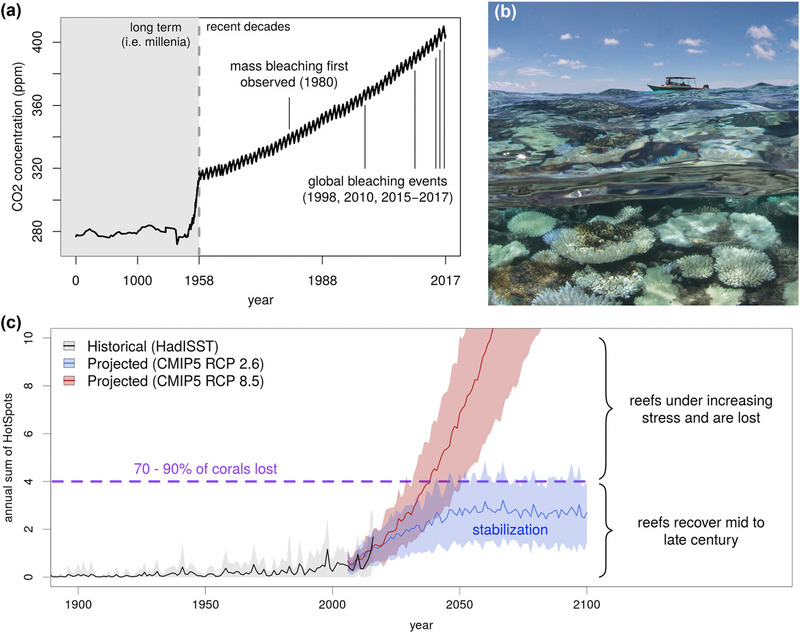 This figure, from a recent paper articulating a triage approach to choosing which reefs to save shows a) the increase in atmospheric CO2 and major bleaching events, b) an image of bleaching coral, and c) a projection of episodes of significantly warm water, suggesting most reefs will be lost even if we do bring climate under control (achieve the Paris 2oC goal). Figure © HL Beyer et al. I’ve been pondering because I want to know why this global change to coral reef ecosystems, so powerfully obvious to scientists, managers, and just plain citizens who spend time around reefs, has had a relatively minor impact on people around the world. I vividly remember being at a coral reef conference about a year after the 1998 pan-tropical global bleaching event triggered by the strong 1997-98 el Niño. Talk about the extent of the losses was frequent in the lobbies and bars, and there were numerous papers documenting just how extensively some coral reefs had been damaged. One hope kept emerging; this would be the crisis the world needed to wake up to the risks of climate change. Those corals would not have bleached in vain because, like so many canaries in coal mines, they would wake up the world. Shows how naïve the science community can be! We saw what was happening and understood what it predicted; rest of the world, not so much. Severe bleaching has been hitting coral reefs only since the early 1980s (a), but the frequency of events is increasing (d) and very few reefs have now not been severely bleached at least once (b). 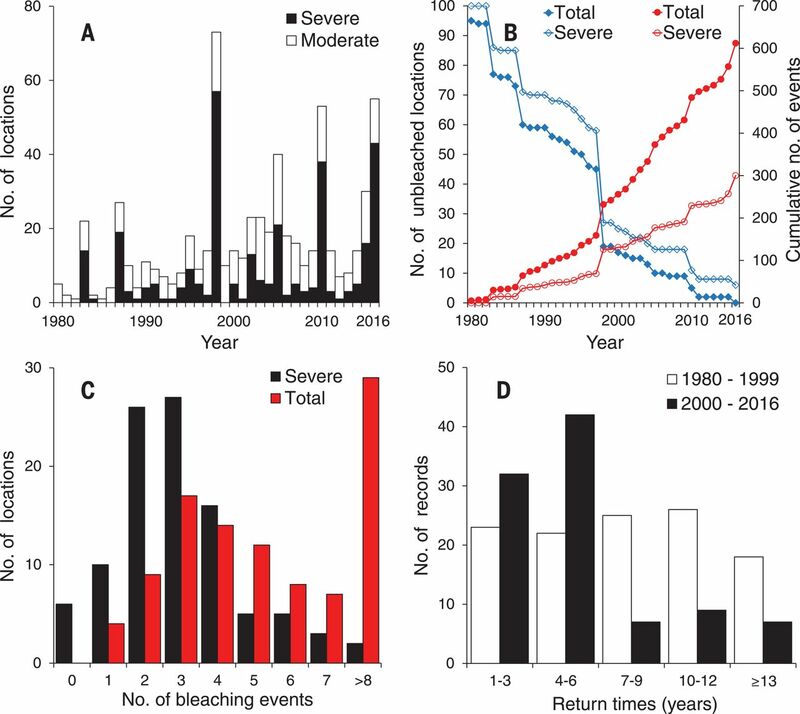 Most reefs have been bleached multiple times (c), and each time there is some mortality. Overall, this is a grim picture for people who’d like to see reefs on this planet later this century, especially given that the return times are now insufficient for adequate recovery of reef ecosystem structure. Figure © TP Hughes and Science. While I am particularly sensitized to news about how coral reefs are faring as the climate changes, there is now abundant evidence from all over the world that our changing climate is having major impacts. Yet still there remain many people who think climate change is unimportant. It’s an environmental story, something that is ‘too bad’ or ‘a pity’ or even ‘Geesh, who’d a believed that’. But it’s not a sign that we really need to move on combating climate change before it is too late. Somehow, the great bulk of humanity is far less troubled by the signs climate change is leaving all about us than am I, or many other environmentally aware people. Most people have no sense of urgency. As I have pondered, as I have watched reactions when I speak on climate change to groups of citizens, and as I have lain awake nights wondering why most people just don’t get it, I’ve identified, talked about, and then discarded one explanation after another. Most people have not yet been confronted with the evidence. Most people do not understand the science. Most people have been led astray by a powerful denialist campaign of disinformation and contradiction. Most people have belief systems that just do not permit the possibility of existential crisis. Most people are in denial because while they understand what is happening they are too selfish to make any changes to their lives to prevent it. Each of these possibilities is valid, to a degree, for some of those people. But even when I talk about these reasons for failing to see what is happening, that does not seem to sway people. There has to be something more. As a scientist, I have found it difficult to recognize that people do not make most decisions based on a rational analysis of the evidence. 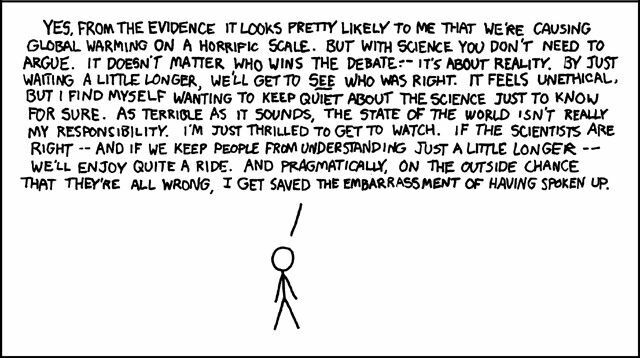 As a person, who likes to think that he acts rationally most of the time, I’ve found it even more difficult to recognize that most people do not try and become rational evaluators of the evidence the moment a scientist points out to them that they should do so. It is not that we fail to succeed at rational analysis of the evidence; it’s that we don’t put all that much stock in the value of acting rationally. As a scientist, I now know that most people do not go through their lives acting as a scientist would. And I have a nagging suspicion that I also do not go through life acting as a scientist would either. Apart from the decisions we make in order to satisfy immediate personal needs – everything from scratching an itch, to grabbing food when hungry, to seeking sexual gratification – our decisions may contain an element of rationality, but they are also a driver of our behavior as members of social groups, and as such they are in turn driven by many other factors beyond a science-like attention to facts. Two psychological papers demonstrate some of the complexity involved. A colleague recently drew my attention to a 2011 paper by Robert Gifford, published in American Psychologist. Gifford is an environmental psychologist who investigates the psychological aspects contributing to why we think and act the way we do on environmental issues. Under the delightful title, “Dragons of Inaction” his paper discusses seven general types of psychological barrier that together impede our ability to act to remedy climate change. As Gifford puts it, there is a “gap between attitude (“I agree this is the best course of action”) and behavior (“but I am not doing it”) with regard to environmental problems.” This gap is created by these dragons, the psychological barriers. These are not new barriers devised by Gifford, but his paper was the first to bring discussion of them together. Gifford identifies 29 different barriers, which he groups into the seven dragons. The seven dragons are limited cognition, ideology, comparison with others, sunk costs, discredence, perceived risk, and limited behavior. By limited cognition, Gifford means that we are famously less rational than we tend to assume. Within this category, he includes the fact that our brains evolved to respond to immediate, personal threats (those stalking sabre-toothed cats), and ignorance. He suggests ignorance on topics such as climate change includes both lack of knowledge that the problem exists (there are undoubtedly a few people still so ill-informed even in developed countries), and lack of knowledge about what to do about it. Many people are unable to state precisely what is causing climate change and what possible remedies exist; and while knowledge of this type is growing, that learning is impeded by 1) the technical complexity of the subject, and by 2) the mixed messages in the media. The latter arise due both to ineffective simplification of complex issues in publicly accessible media, and to deliberate denialist campaigns to distort or confuse, funded by groups or individuals with vested interests in continuation of present policy on e.g. use of fossil fuels. Environmental numbness arises because we are organisms that always tune out perceptions that are less immediately important to us, and because we also tune out repeated messages, the no longer new news. Uncertainty is a barrier to responsiveness to environmental problems because we are organisms that tend to act in ways that favor immediate self-interest (those sabre-toothed cats again). Since it is not possible to predict with certainty the pace, extent or consequences of future climate change, and since the science is usually presented along with accurate statements regarding degree of certainty, the human organism is predisposed to discount the risk of not acting to mitigate climate change, preferring to continue current patterns of behavior. This effect of uncertainty creates real difficulties for those attempting to explain the science; making scientifically unjustified claims of certainty about future events might galvanize action by the public, but at the real risk of blowing up any credibility environmental scientists still possess. Presenting the information accurately and dispassionately leads to a less effective uptake by the lay public. By judgmental discounting Gifford refers to our rather weak capacity for correctly estimating risks at distant times in the future. We tend to estimate risks of poor environmental outcomes as greater in other places than here even when there is no real difference, and we underestimate the severity of future risks here. Consequently, we are less likely to act here and now to mitigate those risks. Optimism bias refers to the widespread tendency to assume the best for ourselves. Each of us will live forever in a happy and prosperous society even though other people will suffer and die. I have difficulty seeing how Gifford separates optimism bias and judgmental discounting. They seem to me like two sides of the same coin. Limited cognition’s final aspect is perceived behavioral control, by which he means the perception that an individual’s actions can have any impact on future events. Climate change is so complex and so global that it is common for individuals to shrug their shoulders and conclude that anything they might do will have no meaningful effect. In Canada, while I often run into the ‘what good can I do’ comment reflecting this perceived lack of individual behavioral control, I also hear the comment, “Why should it matter if Canada reduces its CO2 emissions; we only contribute 1.7% of total emissions per year?” That Canada still ranks within the 10 most highly emitting countries is forgotten, sometimes deliberately as a way of justifying inaction, but sometimes simply because of perceived behavioral lack of control applied not to the individual but to the nation. The second of Gifford’s seven dragons is ideology. He includes here worldviews, suprahuman powers, technosalvation, and system justification. A commitment to free market capitalism is the worldview least likely to favor action on climate. Formal religious beliefs in an all-powerful deity that cares about individual humans, more secular belief in an all-powerful ‘nature’, faith in humanity’s capacity for technological innovation to solve problems, and strong desire to not disturb the status quo socio-political system are other identified aspects of ideology. In all these cases, the belief system provides strong incentives to not act on climate change. Putting it more simply, beliefs trump facts. This person is not putting beliefs ahead of facts, he’s just refusing to reach a conclusion! Comparisons to others is the third dragon. Included here are social comparison, social norms and networks, and perceived inequity. People tend to act in ways that mirror actions of others. Sometimes normative action is perceived and emulated (this tendency can be enhanced by effective social networks that facilitate the behavioral comparisons). When societies are perceived as inequitable, the tendency to behave unselfishly is reduced. Taken together its clear that changing behavior to achieve environmental goals has to take account of the social milieu in which the individual actors are embedded. 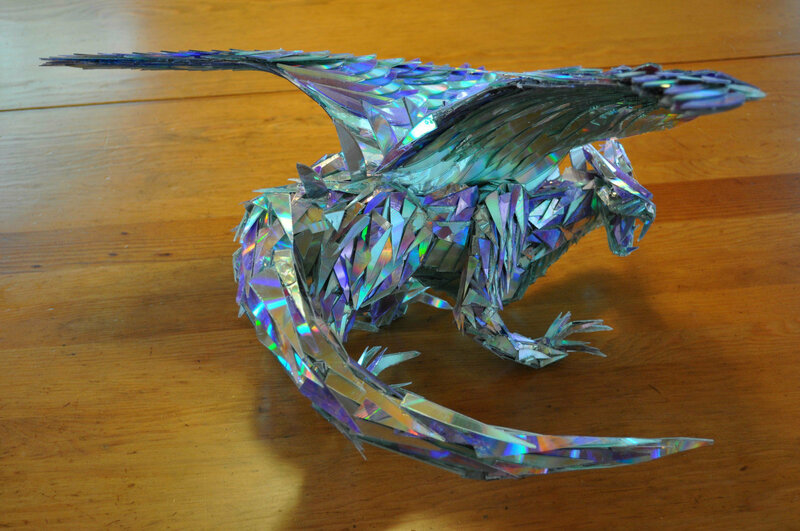 Sunk costs, the fourth dragon, includes behavioral as well as financial costs, conflicting values, goals or aspirations and attachment to place. Habitual patterns of behavior are an impediment to behavioral change because they are habits, in much the same way that prior investment in particular ways of doing things – ownership of a car, for example – can impede changes in behavior because change will cost money. Humans rarely find their various individual goals all aligned, and conflicting values, goals or aspirations can all impede the kind of behavioral change needed to solve environmental problems like climate change. Attachment to place can give rise to classic nimbyism because of a desire that that place never change and, in this sense, such attachment becomes a sunk cost. Of course, attachment to a place can also be a prime motivator for action to protect that place, including action to protect its climate. Discredence, the fifth dragon, refers to tendency to disbelieve or even to be defiantly opposed to those supplying information and recommendations on environmental issues. Trust is generally seen as essential for listeners to receive messages being delivered, and trust of citizens towards scientists or government officials can easily be lost. Sometimes recommended programs of action can seem unlikely to be effective, particularly programs that are modest in scope or entirely voluntary. Perceived ineffectiveness does not encourage adoption and participation in the program. A more aggressive level of opposition comes in the form of denial, sometimes simply a way of rationalizing a desire not to comply with or support environmental action, but sometimes denial is motivated by fear and becomes a way of blocking out bad news. Also included under discredence is reactance, the tendency to react negatively to messages from particular distrusted sources. Many people begin their assessment of information about climate change under an assumption that if it comes from a government agency, or from a member of ‘the elites’, it is not to be trusted. Again, I’m unsure how I would differentiate lack of trust from reactance; the difference is nuanced. Gifford’s sixth dragon is perceived risk. This is the risk one takes on by changing behavior in order to address climate change – the risk of acting, rather than the risk incurred by ignoring the problem. Again, Gifford sees several different types of risk in acting: functional, physical, financial, social, psychological and temporal. Functional risks are risks that the new behavior will not be effective in combating the environmental problem. Physical risks are direct risks to individual wellbeing incurred by changing behavior. Financial risks refer to the possibility of added costs that may never be recouped, relative to the cost of continuing one’s life ignoring climate change. Social risk is the risk of being ridiculed or ostracized by one’s social group because of the new behavior adopted, and psychological risk is damage to self-esteem such ridicule might provoke. Finally, temporal risk refers to the time in planning and undertaking behavioral change that will have been wasted if the new behavior does not improve the environmental issue. Gifford illustrates these kinds of risk by considering the purchase and use of a PHEV (plug-in hybrid) vehicle as a way of cutting one’s carbon footprint. Such a decision carries each of these risks. The PHEV, as new technology, may have problems preventing it from performing as expected (functional), it may be a less safe vehicle than the old SUV traded in for it (physical), it will certainly cost more to purchase (financial), owning it may invite scorn or ridicule from erstwhile friends (social) which may lead to depression (psychological), and the time taken in researching, deciding to purchase, learning how to operate it, and perhaps obtaining professional psychiatric help (temporal) may not have been worth it. Who knew purchasing a PHEV could pose so many different kinds of risk? I did it anyway. 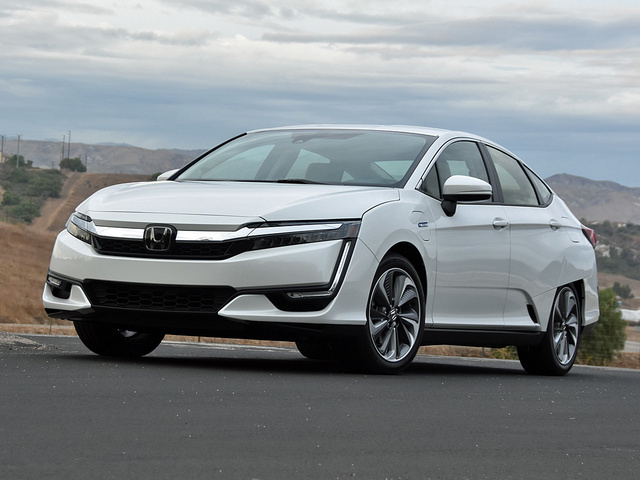 Image of Honda Clarity © Car Gurus. Having recently purchased a PHEV, I’ve found all these risks miniscule. So maybe the PHEV option has become less risky since 2011. Or maybe I am still busy justifying to myself that I made the right decision? Gifford’s final dragon is limited behavior. Today, many people are engaged to some degree in actions to reduce climate change. Some people are more engaged than others, yet most of us could do more than we are currently doing. As well as buying a PHEV, I could choose to become vegetarian and put solar panels on my roof (among many other choices), but I have not chosen to do so. In this way, I have limited my behavioral change. Gifford divides limited behavior into tokenism and rebound. Tokenism involves the adoption of easier, less costly or less disruptive changes to behavior and then ignoring other possible changes. Most of us are guilty of this to some degree. Rebound occurs when, having made a behavioral choice in favor of reducing emissions, we slack off, perhaps bringing our carbon footprints back to where they were before we acted. Taken together, tokenism and rebound act to limit what each of us might do in response to the climate emergency. In essence, we are accepting that there needs to be a reduction in emissions of CO2, and we make some modest attempt in that direction; then we move on to other things (because it’s not healthy to obsess constantly about climate change), perhaps increasing our emissions in the process. Gifford argues that these seven dragons of inaction need to be dealt with in any planning exercise or modeling effort designed to improve the acceptance of the need to act on climate change or similar environmental issues. He notes that some of these dragons may be far more important than others, and like all good academics he calls for more research. But he also makes clear that how individuals respond to messages about issues like climate change depends as much on social milieu, emotion, and motivation as it does on the nature of the message sent. He also stresses that those of us seeking to inspire people to act on climate change need do the necessary research to identify ways of slaying these seven dragons. The second article appeared in Perspectives on Psychological Science in July 2018. Written by Leaf Van Boven of University of Colorado, and two colleagues at UC Santa Barbara, the article is titled, “Psychological Barriers to Bipartisan Public Support for Climate Policy”. It is specific to the USA context, but I believe the principles it highlights would apply, with variation in other countries also. At the present time, there appears to be a stronger polarization of attitudes to climate change in the United States than is the case in most other countries. For many reasons the issue of climate change has become particularly strongly politicized in that country, and politics there is now very strongly polarized. 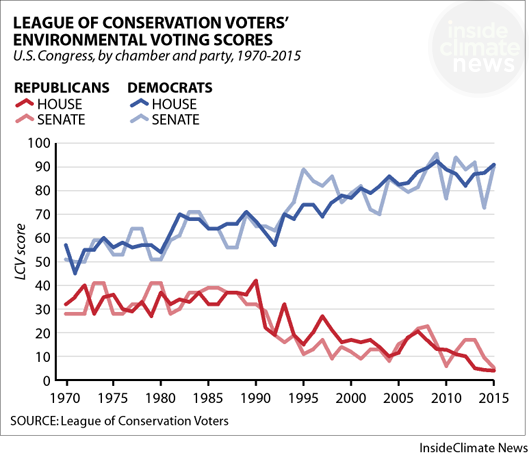 Data from the League of Conservation Voters reveals a widening gap between Democrat and Republican members of US Congress. This gap reflects the politicization of climate change in that country. Image © Inside Climate News. Van Boven and colleagues did three things. First, they conducted in-depth interviews with four recently retired members of the US Congress – two Democrats, two Republicans, one of each from the House of Representatives and the Senate. All four had had particular interest in climate issues and had worked on cap-and-trade or climate-tax proposals when in the legislature. Second, they undertook two population surveys (in 2014 and 2016), each of just over 1000 voters from across the USA. The surveys explored voters’ opinions of climate change issues, but also explored their expectations concerning the opinions of others. Third, they had participants in the 2014 survey take part in an experiment in which each read a description of a climate mitigation strategy (a cap-and-trade strategy or a carbon-tax). The participants were divided, based on the survey results, into Democrats, Independents, and Republicans, and half of each group received information that the policy they read about had been proposed by Democrats and opposed by Republicans in Congress. The other half were informed that the policy described had been proposed by Republicans and opposed by Democrats. The results are interesting. Van Boven and colleagues showed that the majority of Republicans as well as the majority of Independents and Democrats, accept the reality of human-caused climate change. True, a smaller proportion of Republicans than of Democrats share this view – the mean response for Republicans was < +1 on the scale from -3 to +3 in each year, while the mean for Democrats was slightly less than 2. But both distributions of responses were clearly on the right-hand side of the figure they provide. Independents scored between Democrats and Republicans. Results of surveys in 2014 (a) and 2016 (b) in which respondents were asked to rate a series of statements about climate change on the scale: –3 = strongly disagree; –2 = moderately disagree; –1 = slightly disagree, 0 = neither agree nor disagree, +1 = slightly agree; +2 = moderately agree; +3 = strongly agree. It’s clear that Democrats agree with the idea of anthropogenic climate change more strongly than Republicans, but it’s also clear that the majority in both groups generally supports this concept. Independents are intermediate in their responses in both cases. Image © Van Boven and Sage Publications. Van Boven and colleagues comment on how well hidden is the fact that most Americans of all three political persuasions accept the reality of climate change. This observation seldom appears in media reports. The observation that the great majority of climate skeptics (71% in both surveys) are Republican is the sort of result that does get emphasized by the media (while the fact that these are a minority (only 25%) of all Republicans is seldom spelled out). The surveys asked respondents for their opinion on how the ‘typical’ Democrat or Republican would view climate change. Respondents tended to underestimate the extent of support for climate change ideas by ‘typical’ voters from both parties, but they underestimated Republican support more strongly. In other words, people think voters identifying with the two political parties are further apart in their views on climate than they are. From my perspective, the most interesting result was in how respondents reacted to cap-and-trade or carbon tax proposals, depending on whether they had been told the specific policy had been proposed by Democrats or Republicans. If people were rational decision makers, they would evaluate described policies in a way that was congruent with their own view of the importance and the cause of climate change. But that is not what happened. To a much greater extent, their responses were dictated by which party was reported to have proposed the policy. Democrats disliked Republican policy and Republicans disliked Democrat policy even when the policy description was identical. Figure showing actual responses by respondents of designated political affiliation as well as their expectations of responses by ‘typical’ members of each party, to policies ostensibly proposed by either Democrat or Republican legislators. Democrats favor Democrat policy and Republicans favor Republican policy, even when it’s the same policy. And respondents think ‘typical’ members of each party will give party even higher priority than they do themselves. Figure © Van Boven and Sage Publications. Conservation science has long recognized the importance of ‘respected local leaders’ in encouraging the adoption by a community of novel conservation actions. It is always more effective if a respected older fisher is able to articulate the benefits of establishing a closed season or a no fishing reserve as a way of sustaining the local fishery. Far better they hear it from the respected elder than from a youngish, foreign-looking stranger who flew in to talk to them one Friday. The same clearly applies to American members of political parties, and, I suspect, to some degree, within all advanced societies. Better we hear the novel proposal from someone just like us. Otherwise, on what basis do we believe the message? How Do We Have Rational Discussion and Consensus Building around Environmental Policy? Climate change and the environmental crisis more generally inevitably becomes a political problem the moment we move from describing what is happening to talking about changes in our behavior to remedy, repair, or avoid such problems in the future. Taken together these two papers tell us that the discussion cannot be assumed to be entirely rational, a dispassionate examination of the facts. People do not work like that. In discussing his seven dragons of inaction, Gifford has focused on impediments to individuals changing their own behavior to improve climate outcomes. He has revealed a long list of ‘extraneous’ factors that impede rational decisions to act. Van Boven and colleagues have looked at one ‘extraneous’ factor that influences how individuals respond to climate change or policies being proposed to deal with it. The importance of political affiliation, both of the individual and of the messenger (politician) who offers a policy for consideration, is remarkably clear. In Gifford’s terminology, there are three dragons acting here: Ideology, Social Comparison, and Discredance. In the USA, bulwark of capitalism, anything that smacks of limiting individual action will be resisted by a large minority of people. Many Americans are ideologically incapable of viewing socialist solutions to shared problems favorably – be they a clean environment or a functioning health or education system. They have been vaccinated against approaches that do not begin with the primacy of individual freedom. At present, political polarization in the USA is so pronounced that one’s political ‘tribe’ or social group is of major importance in determining how to respond to environmental messages. And recommendations that come from outside one’s tribe are automatically discounted. In less politically polarized communities these effects of ‘tribe’ will surely be less pronounced, but we’d be naïve to expect they would not be present. Climate change is an immense problem which is only going to be solved by a monumental transformation of the human enterprise. While ‘the market’ may well ultimately adjust our behavior, I don’t have any expectation that markets will move against short-term self-interest and in favor of long-term communal (actually global) benefit sufficiently quickly to avoid catastrophic changes to our environment. The time lags in the climate system are simply too great, and the required shift in human behavior too large for us to rely on market forces, no matter what some economists may believe. Market forces work best when they are serving short-term self-interest. Where is the evidence they have ever worked against that in favor of long-term global interest? Nor is climate change going to be solved by us somehow engaging significant numbers of individuals across the planet to each do those things they can do individually to rein in their carbon footprints. Apart from the fact that individual actions would do little to transform continental scale power grids to the extent they must be changed, Gifford’s seven dragons have not magically disappeared simply because he named them and provided a list. How do we get an individual like me, who certainly sees climate change as a major problem that must be solved, to go beyond the token steps I have taken so far in my personal life? 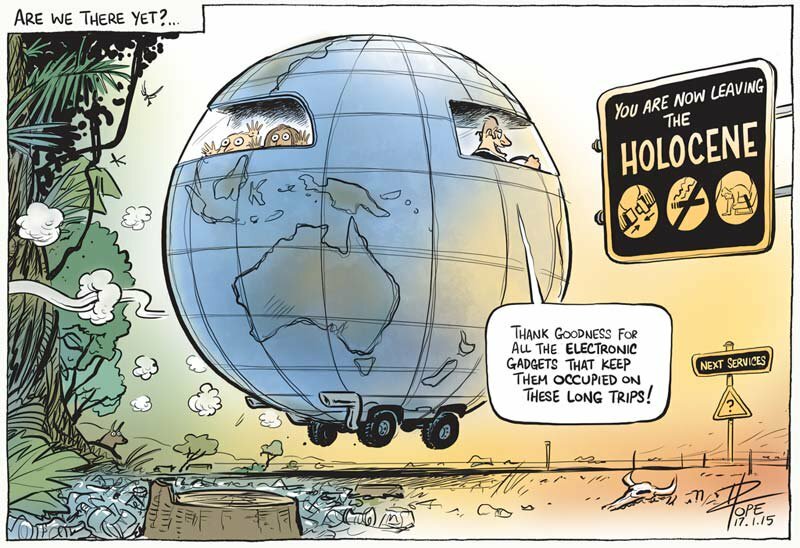 On the kind of time scale that we must adopt if we want a smooth transition into a safe post-Holocene world? Individual action won’t go nearly far enough, fast enough to do the job, any more than will waiting for the markets. Whether we admit it or not, we have already left the Holocene and will have to do what we can to keep the Anthropocene livable. Knowing how and why we individually respond to climate messages as we do should help us forge better policy, likely not in time to save many coral reefs. Solving climate change is going to require a global, political effort. The largest such global effort ever attempted, at a time when we are still infants in learning how to behave as an effective global community. We have been making halting progress until now, using the politically weak structures we have in place, and the pace has been distressing to those who recognize the problem and want to see solutions. Political action requires consensus (except in systems run by autocratic strongmen), and global political action is particularly challenging in this regard – especially so in a world made up of nations with very different worldviews and modes of governance, including some autocratic dictatorships. It is not the job of the scientist, or other technical expert, to solve the problems of how to effect global change, but that expert does have an obligation to attempt to provide sound information to people who have the skills to navigate the passageways, tunnels, and smoke-filled rooms that constitute the path toward effective political action. Finding the most effective ways to influence political leaders, including finding ways to encourage strong coordinated pressure from constituents of those leaders, and finding effective ways to reward positive achievements while shaming inaction or action in inappropriate directions have to be high priority for those who want climate change brought under control. Gifford’s seven dragons stand in front of each of us. They are seven of a larger set of dragons, including some that focus only on derailing useful political progress. The sooner all the dragons can be named and discussed, the sooner they can be tamed. 3 Responses to Dragons and Tribes: more about communicating the coral reef story to the public.